The NVIDIA GeForce GT 435M is a fast mid-range laptop graphics card presented in 2010. It is based on the GF108 core, which is related to the Fermi (GF100) architecture. Therefore, it supports DirectX 11 and OpenGL 4.0. In contrast to the GT 415M, the card features the full 96 shader cores. The difference to the slower GT420M and GT425M chips is the higher core and memory clock rate. The GF108 core of the GT 435M is related to the GF100 core of the GeFore GTX 480M and offers 96 shaders and a 128 Bit memory bus for DDR3. Except for the memory controllers the GF108 can basically be considered a halved GF106. Therefore, the architecture is not comparable to the old GT215 (e.g., GeForce GTS 350M) or GT216 (e.g., GeForce GT 330M) cores. Unlike the GF100 the smaller GF104, GF106, and GF108 core were not only shortened, but also considerably modified. In contrast to the GF100, which was designed for professional applications, these chips target the consumer market. They feature more shaders (3x16 instead of 2x16), more texture units (8 instead of 4) and SFUs per streaming multi-processor (SM). As there are still only 2 warp schedulers (versus 3 shader groups), Nvidia now uses superscalar execution to use the higher amount of shaders per SM more efficiently. In theory, the shaders can thereby be utilized more efficiently and the performance per core is improved. However, in worst case scenarios the performance can also be worse than of the GF100 (and its predecessors). The ECC memory protection, which is important for professional applications, was completely omitted and the FP64 hardware shortened (only 1/3 of the shader are FP64-capable and therewith only 1/12 of the FP32’s performance). Because of these cutbacks, the size of the SM grew only by 25% despite the higher number of shaders and larger warp schedulers with superscalar dispatch capabilities. Due to the different shader architectures and the higher clock rate of the shader domain, the core count can not be directly compared to AMD cores of the Radeon 5000 series (e.g. HD 5650). Detailed information on the GF104 architecture (and therewith also the GF106 and GF108) can be found in the desktop GTX 460 article by Anandtech. The performance of the GeForce GT 435M is on average as fast, as a Mobility Radeon HD 5650 and therefore in the upper middle class (in 2010). As the GeForce GT 435M features a new architecture, the performance is not comparable to older chips with a similar core count (like the GTS 250M e.g.). The DDR3 graphics memory combined with the 128 Bit bus should be the bottleneck of the GT 435M. In our tests, the GT435M handled demanding games of 2010 like Mafia 2 or Battlefield: Bad Company 2 with medium details and WXGA resolution settings. Less demanding games like Fifa 11 or StarCraft 2 (single player) can be played in high details without stuttering. More gaming benchmarks can be found below. A novelty of the GF104/106/108 chips is the support of Bitstream HD Audio (Blu-Ray) output via HDMI. Alike the Radeon HD 5730, the GT 435M can transfer Dolby True HD and DTS-HD bitstream-wise without quality loss to a HiFi receiver. The GT435M offers the PureVideo HD technology for video decoding. The included Video Processor 4 (VP4) supports feature set C and therefore the GPU is able to fully decode MPEG-1, MPEG-2, MPEG-4 Part 2 (MPEG-4 ASP - e.g., DivX or Xvid), VC-1/WMV9, and H.264 (VLD, IDCT, Motion Compensation, and Deblocking). Furthermore, the GPU is able to decode two 1080p streams simultaneously (e.g. for Blu-Ray Picture-in-Picture). Through CUDA, OpenCL, and DirectCompute 2.1 support the GeForce GT 435M can be of help in general calculations. For example, the stream processor can considerably faster encode videos than a fast CPU can. Furthermore, physics calculations can be done by the GPU using PhysX (e.g. supported by Mafia 2 or Metro 2033). According to Nvidia, support for 3D Vision on the new graphics cards is also new. It enables the laptop to send 3D contents (3D games, 3D Web Streaming, 3D photos, 3D Blu-Rays) to a built-in 3D enabled screen or an external 3D TV (only if supported by the laptop manufacturer). According to rumors, the power consumption of the GeForce GT 435M should be about 40-45 Watt (TDP including the MXM board and memory), and therefore suited for 15” laptops (comparable to the HD 5730). Without load, the chip is clocked at 50/100/135 MHz (chip/shader/memory) in 2D respectively 200/400/325 in 3D mode to save power. Furthermore, the 400M series supports Optimus to automatically switch between the integrated graphics card from Intel and the Nvidia GPU. However, the laptop manufacturers need to implement it and it cannot be upgraded. The NVIDIA GeForce GT 415M is a fast mid-range laptop graphics card presented in 2010. It is based on the GF108 core, which is related to the Fermi architecture. Therefore, it supports DirectX 11 and OpenGL 4.0. In contrast to the GT 420M, the card features only 48 of the 96 shader cores. Therfore the performance should be clearly below the GT 420M (as both feature the same clock rates). However, Nvidia still classifies the card in the performance class (the GeForce 310M is Mainstream). As graphics memory, the GT 415M supports only (G)DDR3 and no GDDR5. The GF108 core of the GT 415M is related to the GF100 core of the GeFore GTX 480M and offers 96 shaders and a 128 Bit memory bus for DDR3. Except for the memory controllers the GF108 can basically be considered a halved GF106. Therefore, the architecture is not comparable to the old GT215 (e.g., GeForce GTS 350M) or GT216 (e.g., GeForce GT 330M) cores. Unlike the GF100 the smaller GF104, GF106, and GF108 core were not only shortened, but also considerably modified. In contrast to the GF100, which was designed for professional applications, these chips target the consumer market. They feature more shaders (3x16 instead of 2x16), more texture units (8 instead of 4) and SFUs per streaming multi-processor (SM). As there are still only 2 warp schedulers (versus 3 shader groups), Nvidia now uses superscalar execution to use the higher amount of shaders per SM more efficiently. In theory, the shaders can thereby be utilized more efficiently and the performance per core is improved. However, in worst case scenarios the performance can also be worse than of the GF100 (and its predecessors). The ECC memory protection, which is important for professional applications, was completely omitted and the FP64 hardware shortened (only 1/3 of the shader are FP64-capable and therewith only 1/12 of the FP32’s performance). Because of these cutbacks, the size of the SM grew only by 25% despite the higher number of shaders and larger warp schedulers with superscalar dispatch capabilities. Due to the different shader architectures and the higher clock rate of the shader domain, the core count can not be directly compared to AMD cores of the Radeon 5000 series (e.g. HD 5650). 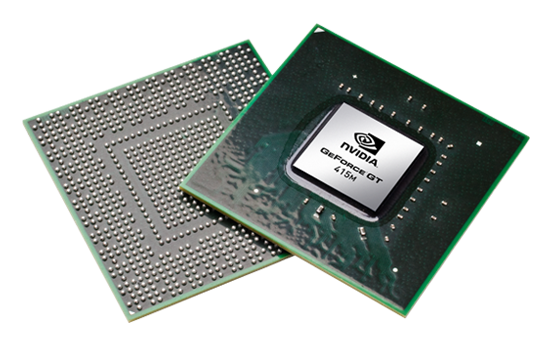 Because the GeForce GT 415M features a new architecture, the performance is not comparable to older chips with a similar core count. As the GeForce GT 420M showed a smiliar performance as the old GT 330M (in our tests with a pre-sample), the performance of the GT 415M should below, approximately the level of the GeForce GT 320M / Mobility Radeon HD 4570. A novelty of the GF104/106/108 chips is the support of Bitstream HD Audio (Blu-Ray) output via HDMI. Alike the Radeon HD 5470, the GT 415M can transfer Dolby True HD and DTS-HD bitstream-wise without quality loss to a HiFi receiver. The GT415M offers the PureVideo HD technology for video decoding. The included Video Processor 4 (VP4) supports feature set C and therefore the GPU is able to fully decode MPEG-1, MPEG-2, MPEG-4 Part 2 (MPEG-4 ASP - e.g., DivX or Xvid), VC-1/WMV9, and H.264 (VLD, IDCT, Motion Compensation, and Deblocking). Through CUDA, OpenCL, and DirectCompute 2.1 support the GeForce GT 415M can be of help in general calculations. For example, the stream processor can considerably faster encode videos than a fast CPU can. Furthermore, physics calculations can be done by the GPU using PhysX (e.g. supported by Mafia 2 or Metro 2033). Without load, the chip is clocked at 50/100/135 MHz (chip/shader/memory) in 2D respectively 200/400/325 in 3D mode to save power. Furthermore, the 400M series supports Optimus to automatically switch between the integrated graphics card from Intel and the Nvidia GPU. However, the laptop manufacturers need to implement it and it cannot be upgraded.